On a frigid February day, a Minnesota firefighter and his family put Bart, their 13-year-old German Shorthaired Pointer, in the laundry room of their home before leaving to run errands. Bart normally spent his time outdoors, but because of his age and the blizzard-like conditions, they thought he would be safer and more comfortable indoors. 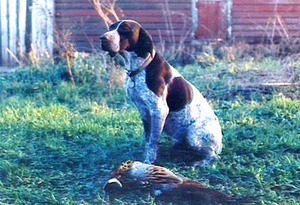 BART is named after a German Shorthaired Pointer who died of smoke inhalation when a first started in his home. When he was found, Bart had his nose beneath the air vent, in a vain attempt to breathe fresh air. He was unresponsive, and the firefighters didn’t have the training or equipment they needed to help him. Bart died at the scene. Veterinary cardiologist Janet Olson was married to one of the firefighters, all of whom were saddened because they felt as if they had let down their fellow firefighter. When she heard the story, she was inspired to start a program that would teach firefighters and other first responders how to help animals they encountered during emergencies and disasters. Basic Animal Rescue Training, or BART (in memory of the dog who died that day), was founded in Minnesota in 2004. The organization helps first responders not only to save animals in distress but also to handle them safely and effectively if needed. The three-hour course is open to firefighters, EMTs, paramedics, law enforcement personnel, and other first responders. Two different sessions are available: one for small animals, one for large animals. Each is approved by the Department of Homeland Security. The curriculum, taught by specially trained veterinarians or veterinary technicians, addresses the importance of the human-animal bond, offers hands-on lessons in handling, restraint, and transportation, and teaches first aid and CPR. Departments that undergo training are eligible to purchase BART’s emergency response kit, which includes such items as poles, snares, muzzles, leashes, bandaging materials, and a resource list customized for each community. A resource list might consist of addresses and contact information for local veterinary clinics, humane organizations, and other animal facilities that might be able to help transport or house animals temporarily until they can be reunited with their families. Olson says interest in and demand for BART has come from all over the country, but she is growing the program slowly, as finances and support allow. It has expanded into Iowa and is in the process of starting up in Oklahoma. “The goal is to eventually be able to provide this training to any first responder across the country who is interested,” Olson says.